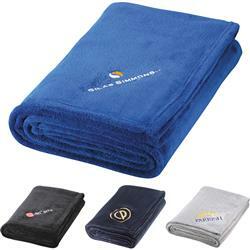 Custom Plush Blankets with your logo imprinted or embroidered. This is such an incredibly soft warm blanket - order extras because folks will take them right out of your office! 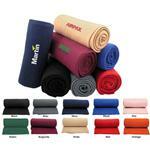 Micro Coral Plush Blankets come in a large 50" x 60" size. 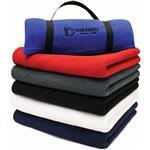 Microfiber fleece. Ultra-plush to the touch. Includes embroidery up to 7,500 stitches. A great promotional blanket. Available Imprint Options: Embroidery. Personalization available for $5.00 per blanket. Materials: Polyester Fleece. 50 x 60 blanket. Embroidered custom logo included to 7500 stitches. 24 per box, each box 28.22 lbs.